By all means imperial and divine! 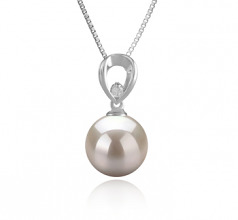 This how we would describe best the Emilia 10-11mm White Freshwater Cultured Pearl Pendant. A fine AAAA luster quality brings the richness of the pearl to the fore. An alluring sterling silver bail design, enriched with a sparkling diamond compliments the pearl in a refined way. 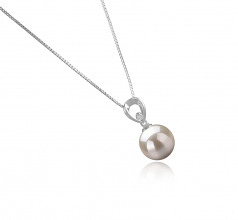 This white pearl pendant therefore has a noble and impressive round shape, making it a really precious piece of jewelry which will flatter women of any age. Pure, exquisite, uncomplicated, this pendant is perfect for the woman who wants to immerse herself in the moment. An AAAA quality is also obvious in its shape, body and overall grade. 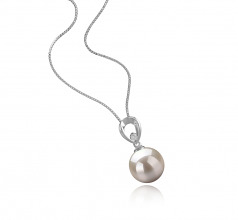 Perfect as a bridesmaid gift or a birthday present, this white pearl pedant will surprise any woman who adores the fascinating world of real cultured pearls. Vibrant and chic, this pearl pendant can also be an excellent bridal accessory for the bride who wants to have a pure and immaculate look! Show only for "Emilia Pendant"